I was fascinated at how the Guardian Media Lab covered the US presidential election last fall. They created what they call a live notification. It's a persistent notification that stays in the drawer, and can change each time it receives new data. They used it to indicate which candidate was winning, and by how many delegates. You can read more about it and how they created it on their Medium blog. Today I will show you how to add something similar to your apps. 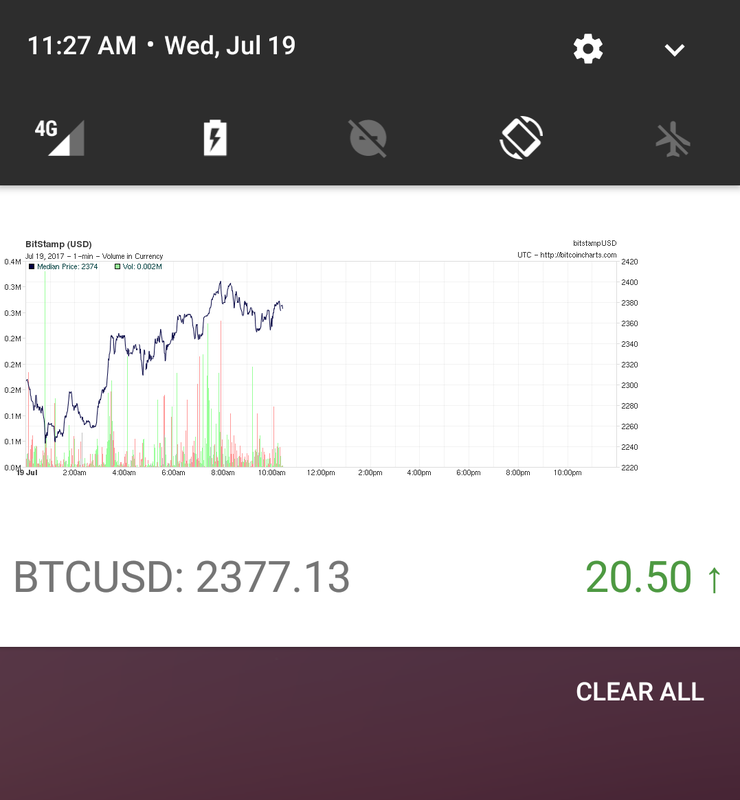 In this concrete example, we'll be building a notification that shows the movement of the price of BitCoin, Ether, or your favourite cryptocurrency. FCM allows us to specify 2 types of payloads - notification and data. They differ in how a push notification is handled when the application is not in the foreground. Using the notification payload requires less work as Android will automatically show the notification if a push is received when the application is not currently in the foreground. The data payload gives us more freedom in showing the notification and allows us to style it to our liking. That is the one we will use. You can read more about their differences on FCM documentation. The data payload takes any combination of primitive key/values. On the device we'll get them as an Android Bundle object using remoteMessage.getData(). As I mentioned, we will get the data from two sources - the current price data from Bitstamp's API, as well as an image of the current price chart - from BitcoinCharts. The current ticker value can be found here. To get the latest price data we can use the sync-request Node library. Making the request synchronously is fine as we are making them on an one-by-one basis. Now we need to send this as a Push to FCM, using the data payload. We can then run it via the standard node index.js command. If you followed the Pusher quick start guide to setting up push notifications you'll have a simple app that subscribes to an interest. It assumes you use the built in FCMMessagingService and attach a listener using nativePusher.setFCMListener(...). This is perfectly fine if you use the notification FCM payload, as the background pushes will be handled and displayed as notifications by the system. Notifications will also stack one after the other. For live notifications that technique will not work unfortunately. We want more freedom in displaying the notifications and we want to reuse existing notifications to show updates. We need to implement our own FirebaseMessagingService. It's now time to display the data in a notification. To inflate the layout in a notification context we'll use RemoteViews. This is a construct that allows us to create views outside of the parent process. Besides notifications, we can also use them to create the home screen Widgets. Now that we have created a notification with the data, we also need an image. Glide is an excellent tool for that. It allows loading images in a RemoteViews object. First, add the library to your app/build.gradle dependencies. At the time of writing, the latest version of Glide is 4.0.0-RC1. Glide has the concept of NotificationTarget where you specify the RemoteViews object and the view ID of an ImageView contained in it. It will then load the image using that target. We'll load the image from a URL we get in the notification. Note that you might also need to call clearDiskCache to clear the image from the cache - in case it has the same hostname and path as the previous image. This will make it always fetch the new image. Last thing to note is that a call to Glide.load needs to happen on the main thread. As a push is received outside of the main thread we'll need to ensure we call it there. That's where the new Handler(Looper.getMainLooper()).post(...) comes to play. The final thing to do is to subscribe to our interest with Pusher. We named it "BTCUSD".